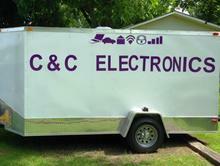 All Service Calls Are Done After 5 P.M.
At C & C Electronics we strive for 100% customer satisfaction!!! Computer repair and customer support for home users and small businesses in Warren, Arkansas and surrounding areas. Specializing in virus, trojan and other malware removal and system recovery. If you’re looking for high quality and personal service, you’ve come to the right place. At C & C ELECTRONICS we’ll give you the attention and personal service you’ll come to expect and enjoy. Our rates are competitive, with no hidden fees. Let us put our experience to work for you.ext.